Home > Archives > Piano lounge in a Sightseer Lounge car, 1980s. Piano lounge in a Sightseer Lounge car, 1980s. Promotional color photograph showing the interior of an original piano lounge on the lower level of a Superliner I Sightseer Lounge car; photo likely dates to the early 1980s. In 1974, Pullman Standard won the contract that, as amended, called for production of 284 new bi-level cars. Manufactured at a plant in Hammond, Ind., the order included 102 coaches, 48 coach-baggage cars, 25 café/lounge cars, 70 sleepers and 39 diners. Amtrak accepted the first Superliner in October 1978, and it was used for the training of Onboard Service and maintenance crews. The final car in the order arrived in 1981—representing a six year, $313 million capital investment on the part of the company. The Sightseer Lounge car includes an upper level with informally arranged swivel chairs and love seats; tall wrap-around windows allow unimpeded views of the surrounding landscape. Downstairs, there is a café and table seating. Originally, the lower level included a small piano lounge across from the cafe. 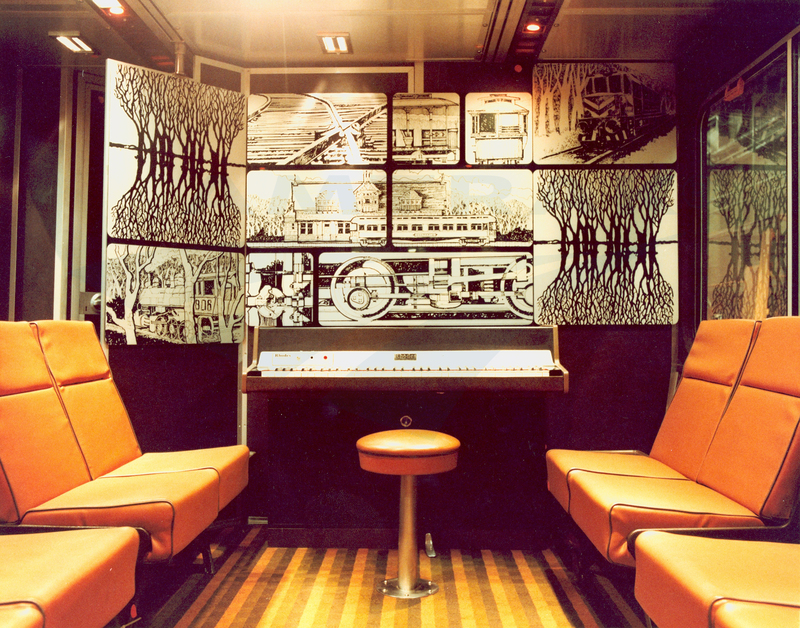 It featured comfortable seating, an electric piano and decorative panels with bold graphics depicting various aspects of railroading. Photographer: Unknown for Amtrak. From the Amtrak Corporate Collection.